The Loft Art Studios and Galleries added 4 new photos to the album: June Group Show — at The Loft Art Studios and Galleries. Gallery 381 at 381 W 6th St., invites you to an Artist’s Reception of “Swimming Into Starlight” by Lorien Eck. This Solo Exhibition will be up through July 6 1st Thursday, and by appointment only. If you have had the opportunity to see Julie Benders Project on the corner of Patton Ave. and 25th St. Be sure to visit her at Sirens Cafe on 7th St.
“In June we continue the year long celebration of the 20th anniversary of the First Thursday Artwalk. 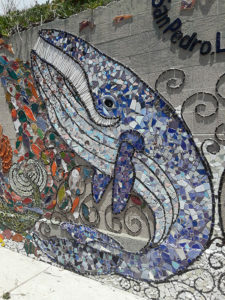 The free Artwalk Tour usually gives a one hour sample of the diverse art scene in San Pedro,– different itinerary each month. The tour leaves at 6:30 from the Chamber of Commerce Board Room Gallery. The Board Room Gallery features the art of Charlotte Strauss. “I love working in oils because of the depth and richness of color that can be achieved. I build my paintings with layers of color until I feel I have captured the essence of the subjects. I enjoy the creative process and every work is a new adventure and learning experience.” The artist lives in Colorado and is a member of the International Guild of Realism. One mind-bending solo show, one richly diverse group show and more than a dozen professional artists. All this will be shown at the Loft Studios during the June 7th San Pedro Art Walk. This month Michael Stearns is curating two exhibitions, in his new downstairs gallery, and Reflections in Blue, a group show in the main upstairs gallery by the Loft resident artists. A short walk bring us to PacArts for our annual visit to join the closing reception of “Novel Concepts”- a solo show and tell. This compelling show by Pac Arts resident Regina Argentin represents a new body of narrative paintings that illustrates three graphic novels she created. The intention is to illustrate these film noir style dystopian stories with paintings that stand on their own, in addition to the charcoal drawings that accompany the books. The pieces represent moments and sometimes overlapping images of novel highlights. Join the new meet up group “Crafters Night Out” every first Thursday of the month. From watercolor to scrapbooking, no matter what your passion is, bring a project you are working on and meet other crafty people. FREE to join in the fun! Crafted is open every First Thursday from 4 to 8 p.m.